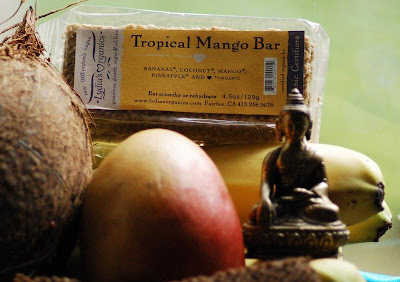 This bar is really tasty if you like the taste of the tropical fruits that I mentioned above. It is totally raw, vegan, gluten-free, organic, and oil free. It only has fruit in it! But, unlike other fruit-only bars, it is hard, thick, and crunchy rather than fruity and chewy, making it quite filling (I actually find the taste to be pretty strong). The consistency reminds me a bit of a granola bar (I'm always on the lookout for great low calorie granola by the way!). In terms of calories, the bar is 43g and has only 110 calories, 7 grams of fat (healthy fat from the coconut), 3 grams of fiber, and 1 gram of protein (so 2 weight watchers points). It also has 10% of the RDA of Vitamin C which is an added plus. I buy these bars at Whole Foods, but I see it is also available in a bunch of natural food stores in various states. I like tropical flavors, specially mango and pineapples. I'll try to find it here. thanks so much for the comment on my blog- it helped me to find yours! Looks like an interesting bar. I've had that bar and I LOVE it! It's delicious over yogurt.